I have the older version of this app and I got it when it was free. My class used this app almost daily. I was able to eliminate paper copies all together with this app. I could scan a worksheet or reading assignment and email it to the kids. When they opened it up in Neu. Annotate, they could write on the document and then resubmit it to me to grade. Yes, I could get a 100 emails a day, but it was great to be able to take all my grading home on my iPad! 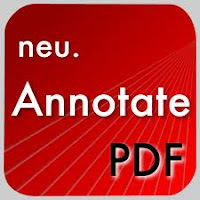 Really, this is a great way for kids to edit and add notes to PDFs.